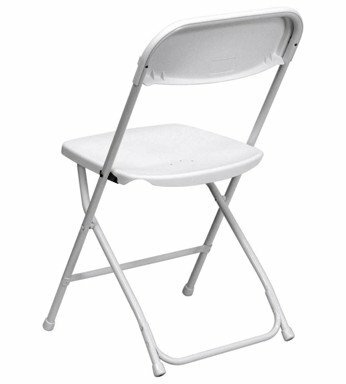 Adult White Folding Chair | San Diego Kids Party Rentals | water slide and bounce house rentals in San Diego and Point Loma, CA. Our Folding Chairs have specially contoured seats and backs making them the most comfortable and ergonomic chairs on the market. We frequently turn-over our inventory of rental chairs to help ensure that you have super-white chairs for your party or event! These lightweight, white plastic rental chairs are easy to stack so that you if you just need to rent a few tables, it's easy to just put them in your car, SUV, mini-van or pick-up truck.